Self storage units are a great way to declutter your life and find temporary homes for things during a move or renovation. Storage pricing varies based on the amenities you are after (such as climate control or winter storage), as well as the size of the storage unit you require. One item that is particularly tricky to store is plants. 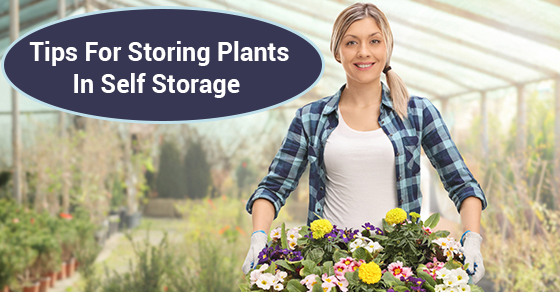 If you are a gardener or a landscaper and you are thinking about placing some of your plants in self storage, below are some things that you need to know. Who Might Need a Self Storage Unit for Plants? People who need to put plants into a self storage unit are usually people who are moving or renovating and need a temporary home for their household potted plants while the house is under construction, or landscapers who need a place to store temporary inventory while they plan for a new job. It is better to utilize a self storage unit for plants during these times because the alternative is turning your car or your garage into a temporary greenhouse. Even though it is likely you are only placing your plants into a storage unit as a short term solution, you should do some research beforehand to determine if your plant is even capable of surviving a short stint in a storage unit. Plants that are able to tolerate low levels are light are the best bet. You should also check with your storage facility to see if they allow plants to be stored (because of pest reasons—especially if they are vegetables). It is wise to water your plants a couple of days before transferring them into a self storage unit so that you give the soil and the foliage ample time to dry. Plants, pots and soil that is wet when it goes into self storage run the risk of developing mildew or fungus problems that could spread to other parts of the unit, as well as kill the plants. You are going to want to store your plants in a climate controlled unit, which will affect the price of your unit. This is especially true during the height of winter or summer, when weather extremes are at their worst and sensitive plants are most vulnerable because of them. The ideal temperature for most plants is between 60-65 degrees F, so keep that in mind when choosing a unit. Keeping plants in a self storage unit should only ever be a short term, temporary solution. Additionally, some plant species are simply not capable of surviving even a short period of time in a pitch black storage unit. If you are thinking about placing your plants in storage, keep the above information in mind.